Twice a year I spend ALOT of money on beading supplies. This year was certainly no exception . Our little town host an Intergalactic Bead and Jewelry show So once again, I put on a comfy pair of shoes and headed out to wonder the show with the masses. I HATE crowds and hate pushy people...both of which are in abundance at the show...everyone wants to look at the pretties :)I did finally manage to worm my way in between some ladies and hit the mother load of labradorite! 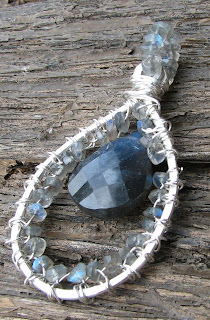 I bought 8 strands of the lovely bluish gray jem!! Yep 8! 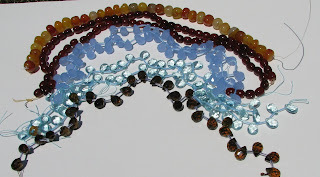 My one splurge of the day was a strand of Grade A Citrine faceted briolettes. This is a pic of my labradorite...I also got some rondelles in various sizes..you just never know when you're gonna need some labradorite! I have lots of things planned for all this stuff. Most importantly to make a few pretties for a special lady in need of some help to fight breast cancer. For more info, please see the link at the side for Pink Purl .There is going to be an auction held and if anyone would like to donate some hand crafted items, it would be greatly appreciated!!!! Either contact myself or Pink Purl if you would like to help out!Purl's post is entitled "Will you help with a gift for life?" 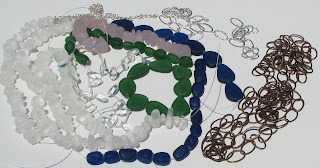 Until next time~ Happy Beading!! Actually two...My favorite artist and jewelry designer is Eni Oken She has a fanominal sence of style and artistic ability. I've been following up on her website for about a year now since I stumbled across her site while surfing the web. I have finally gotten the courage to try one of her intermediate tutorials and add my own twist to it. I'm planning on using some liver of sulpher to age this piece once my sunshine cloths arrive in the mail. I also reworked an earlier piece I wasn't too happy with. 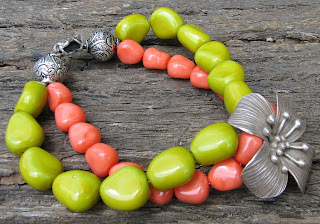 The orange and green bracelet with the big hill tribe silver flower. I had some beads from napal I was saving and thought they would go well with the whole flower motif I have going on.It now fit's better. I have a small size 6 wrist and it was tight on me. 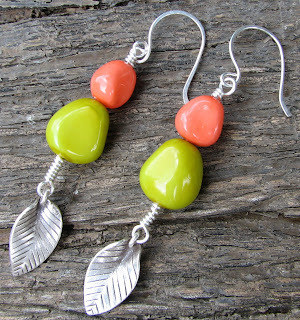 Now it's an average size 7 to 7 1/2.I also made complimenting earrings for it. Hopefully going to get some time tomorrow to add them to my etsy shop and see how well they do. Happy 4th of July ~if anyone actually reads this stuff LOL! It has stopped raining here in Pa so I thought I would take a walk out to the pond and see what was going on. Not too much I'm afraid since we seem to have a cat raiding the pond...all the frogs and fish are very skittish lately and haven't been up to many photo op's. I was never a big cat fan anyway, but this is really making me upset. I'm very attached to all the pond life and hate to go out to a little mangled green guy in the yard. If anyone knows of a good cat deterrant, please let me know!! This is my beautiful peach and white water lily.It seems to have taken over most of the pond this year, so it must be pretty happy...since it's the 4th , it's time to fertilize the lilies so we'll have a few more months of blooms. Please excuse my lack of camera skills! This was taken at the beginning of the season with our new digital camera. The pond has changed alittle since then...more green and lots of pretty flowers!